This table is just what I wanted. You can place items on top as well as the bottom. It looks lovely in my living room. Finish your contemporary living room with the functional Greenough end table. 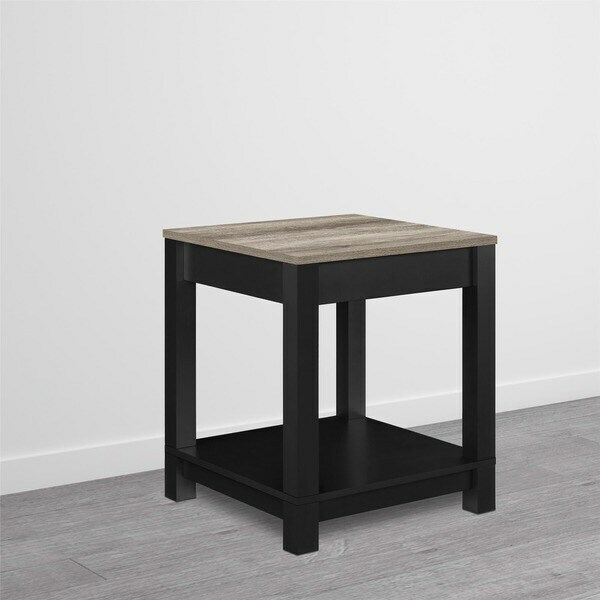 The squared MDF frame features a matte black finish and a woodgrain-style table top for contrast. Accent this piece with a silvertone lamp and store extra necessities on the sturdy bottom shelf. I could not imagine what these tables would like like when I purchased them for such a great SMALL price, But I was totally overwhelmed by how beautiful they came together and now look in my living room!! I absolutely LOVE them!! Do not hesitate. They are heavy, sturdy, and not cheap looking at all!! WOW! a great buy. We like this end table. The black and faux wood match our decor well. It requires some assembly like ikea furniture. Bottom shelf is nice for extra storage. Beautiful table. I love the textured, wood grain on the top piece and it has a nice , smooth, black or espresso finish on the rest of it. The wood is cheap though and don't over tighten any of the cams, screws etc. I just slightly tightened them to where they felt snug, when it all came together the piece is very sturdy on its own. The dowels fit very tightly into the leg pieces and I had to lightly tap them with a tool. The dowels break easy. The holes felt like they were drilled a bit smaller than they should have been for the size of the dowels it came with. To my immediate dismay (insert many expletives) there were no instructions in the box, but I have put many similar pieces together before and this wasn't a serious problem to figure out, instructions may have been available online but I didn't care to look. Overall a good purchase and the finished product was worth it. 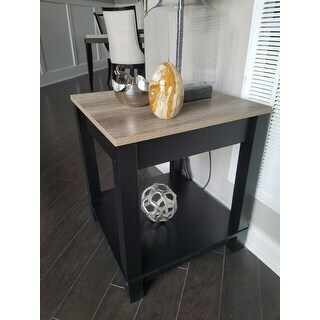 Very nice end table that assembles easily. The table top appears to be made of plastic which provides a great amount of durability. The legs and lower shelf are black press board which require special care to protect from damage. 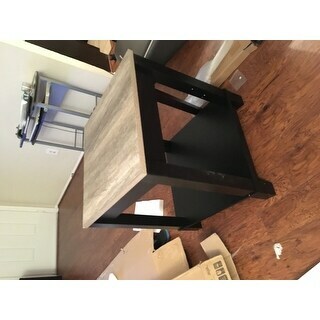 Overall these tables exceeded expectations for the price. Looks exactly like photo. Nice finish on the tabletop and it is heavy enough to support a decent amount of weight. Appears to be decent quality wood, although I just finished putting it together minutes ago. Very easy to assemble. Very well made and sturdy. 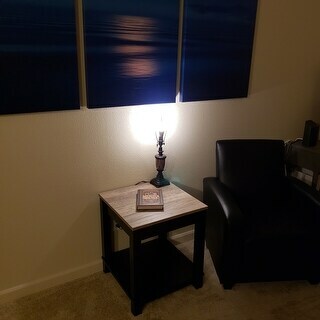 Perfect end table in my den. I love these. They aren't real big so work great in a small space. The contrasting color of black and gray looks great and the bottom shelf is a nice bonus. 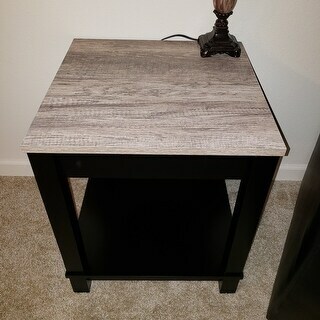 Well-constructed Black Wood End Table. Classic look. I would highly recommend this product to a friend. A very nice end table!! Pretty grey table top and nice black trim. Very sturdy and has an expensive look. It coordinates well with almost any decor. The size is perfect and the price was even better. I am very pleased with the table. Went together very easy. Gray's in top are nice change, and bottom shelf work great for magazines in a commercial office setting. Easy assembly. Good value for the cost. Beautiful table. They look very expensive. The Sonoma Oak finish is lovely.I put the 2 end tables and the matching cocktail table in my great room. 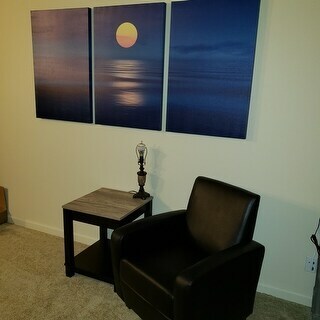 It really looks beautiful with my new couch and loveseat.Changed the entire look of my room. Highly recommend the Carver line of Altra. love it! The wood is very thick and solid. very easy to put together. Beautiful piece added to my living rood has a nice grey oak tone top and black legs. It goes very well with the Ashbury Moroccan rug. I also bought the matching coffee table. We bought two of these end tables and they have been perfect! Very easy to assemble (5 minutes total) and they are very sturdy. We've gotten numerous compliments on them as they look fantastic! This is a nice end table. Love the grey wood. It was a little more difficult than expected to put together otherwise I would give five stars. Really a nice table. I recommend it for anyone that likes the driftwood look. I bought these to go with the coffee table that matches. Received several comments from people that loved the table. "what are the dimensions of these tables?" "Does this end table coordinate with any coffee table? " 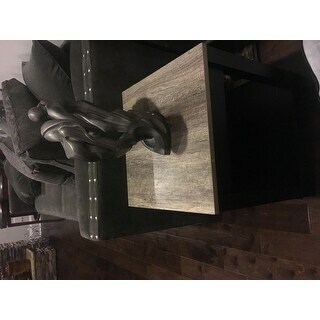 Yes there was a matching 4x4 coffee table, that I purchased along with these end tables. "Does it scratch/ chip easily?" "Will this item be in stock again soon? " "Is the top waterproof? The picture shows a glass of water sitting on the table." "What is the spacing between bottom shelf and top shelf?" Spacing is approx.18" from inside the bottom shelf opening to inside of the table top. Spacing is approx.15" from outside of the bottom shelf opening to outside of the black table tops trim board. A very nice end table! From the edge of the top to the bottom shelf, approx. 15". I hope this helps. "Is there a model similar to this which has a small drawer? I would like to use it as a night stand / table. The color is just right." I have not seen any with drawers. But I still love this table and it would be perfect as a night stand, maybe use a basket on the bottom shelf as a drawer? It's very cute.